Saint Gerasimos Palladas was born in 1633 in the village of Skillous in Pediados, Crete from noble and pious parents. His father Theodoros was the Protopriest and Preacher in Handaka and one of his sermons is still extant which he delivered in 1633 in honor of the Ten Holy Martyrs of Crete. Gerasimos learned his first letters from his father. Later he went to study in Kerkyra and Venice. He knew Greek, Latin and Hebrew. When he returned to Greece he was unable to go to Crete, since it had fallen to the Turks. Therefore he taught and preached in the Peloponnese, Ioannina, Arta, and Paramythia. It is unknown when he was elected Metropolitan of Kastoria, at which time he became a teacher, providing an example of wisdom and holiness. In May of 1686 he was given the Metropolis of Adrianople. 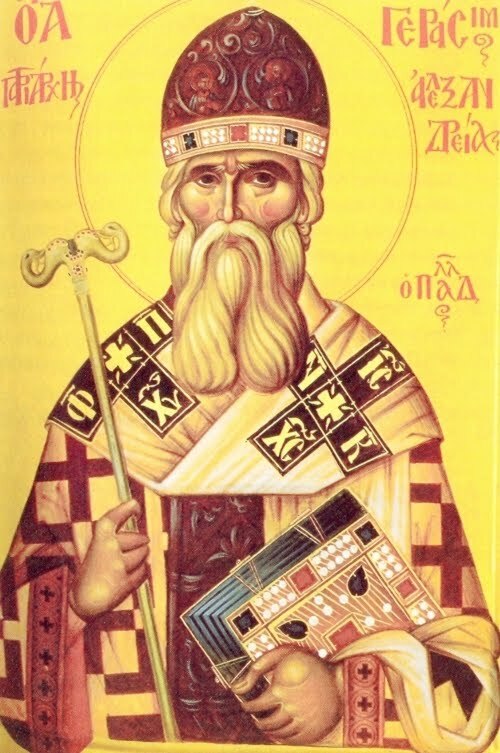 Caesarios Daponte wrote to Mavrokordatos: "They made him Adrianople who was from Kastoria, the most-wise Gerasimos". On 25 July 1688 he was elected Patriarch of Alexandria, successor to Patriarch Parthenios (1678 - 1688) from Bethlehem, who died in an earthquake in Smyrna. His main concern was the spread of the divine word. Many of his handwritten homilies still survive. Due to the many debts of the Patriarchate, he went to Romania and Russia to conduct fundraisers. The rulers accepted him with honors and gave him rich gifts, establishing there Dependencies of the Patriarchate. He worked to resolve the longstanding Sinaitic problem and drafted a regulation for the workhouse of the Monastery of Saint George in Cairo. There exists a prolific correspondence with the celebrities of the era, such as Peter the Great and Pope Clement XI. 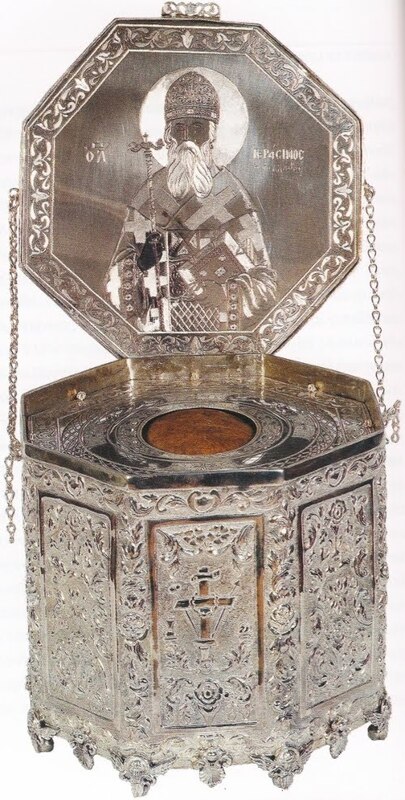 He was accused of innovation during the Divine Liturgy, at the point of the sanctification of the Precious Gifts, which brought on a reaction from the Ecumenical Patriarch, though it ended due to a misunderstanding. On 20 January 1710, after a fruitful 22 years as Patriarch, he resigned due to illness, old age, and for the sake of quietness. He remained in Damietta until May 1712. He then departed for Mount Athos where he lived a life of study and prayer at the Holy Monastery of Vatopaidi, where he venerably reposed in January of 1714. On his tomb was the inscription: "Reposed is the servant of God His Beatitude the Patriarch of Alexandria Lord Gerasimos, in the year 1714 of the month January the 15th of the Indiction". 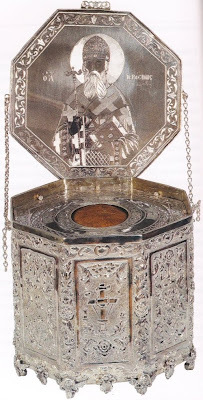 His skull is kept in a silver reliquary at the altar of the katholikon of the Monastery. Saint Gerasimos, according to Caesarios Daponte, was a most-wise and holy theologian and philosopher who probed the depths of Holy Scripture. Gerasimos Mazarakis writes that he was among the major Patriarchs of the East and a Champion of Orthodoxy in his words, writings and by his example. Among his works preserved today are theological, philosophical, hymnographical, and literary writings. The current Archbishop of Rhodes Cyril Kogerakis wrote the Ecclesiastical Service in his honor. The official recognition of his sainthood took place by the Patriarchate of Alexandria on September 17, 2002.